The 27-year-old has only played five minutes for the Hammers since September 1 due to injury problems with both ankles this season. In a week where Andy Carroll had ankle surgery, ending his season, West Ham could be set to welcome another former England international back into the fold. "Wilshere is almost ready, he played already one game with the U21s last week and probably will play another one," said Pellegrini. "Next week, I think he will be working 100% with our squad." Another player Pellegrini can't call on come Saturday is Samir Nasri, after the Frenchman picked up a calf injury whilst warming up on Monday night during West Ham's 2-0 defeat at Chelsea. Nasri's future at the club is in doubt, with his manager admitting that signing him was always going to be a gamble. West Ham travel to Old Trafford on Saturday looking to do the double over a Manchester United side they beat 3-1 at the London Stadium in October. Then managed by Jose Mourinho, United pose a different challenge this time around under the stewardship of Ole Gunnar Solskjaer, despite losing four of their last five games in all competitions. "Maybe two games ago, Solskjaer was the best manager in the Premier League because he had changed so many games at Manchester United," said Pellegrini. "But football changes, results in every game are different, you must continue working until the end of the season." West Ham go into the weekend lying 11th in the table, four points behind a cluster of teams fighting for seventh place and a potential European spot. 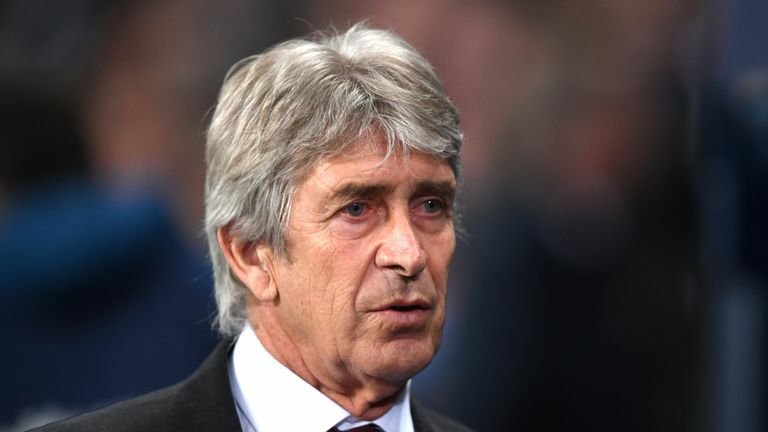 Pellegrini said setting targets can be dangerous when asked if playing in European competition would be a goal for next season, simply saying he wants to see improvements. Manuel Pellegrini says West Ham's season may have been hampered by injuries, but that he and the players must demand more from themselves. "I always demand more for the players, for myself, for everyone," said Pellegrini. "That is why I'm always trying to finish as high in the table as we can. "If you ask me if it's a good season, nine or 10 games before the end of the Premier League we were not fighting for relegation, we had an average of five or six injuries for every game. "Most of the players that arrived here - Wilshere, Yarmolenko, Carlos Sanchez, Fabian Balbuena - they couldn't play the most part of the season. "From that point of view, it's not a bad season, but I think we must all demand more. "The ambition is always to improve, and it's not easy to put a target before you start the season. "This season, we have played some very good games, we had some important defeats also. Next season, our target must be to improve on this one."